Telangana Language Pandits Common Entrance Test LPCET 2018 for those who are seeking Admission into Language Pandits Training Course for the year 2018-19 has been released by State Institute of Education and Training SIET of Telangana. Intended candidates have to wait up to 24th March of this Month for Eligibility criteria because already a controversy is going on present Recruitments of Language Pandits and School Assistant posts also TGT PGT Gurukulam candidates expecting controversy while issuing Appointment Order copies. Telangana State Public Service Commission also mentioned that Hindi Degree should be from UGC NCERT Recognised Institutions only. Don't know wheather they consider Vidwan , Praveen, Madhyama Visharadha as Degree in Hindi. Online applications are invited from the candidates who intend to take admission into language Pandit Training Course (LPT) in Government IASE / CTEs and Private Language Pandit Training Colleges in the State of Telangana through LPCET – 2018 on the dates to be notified shortly through Computer Based Test (CBT) online mode. 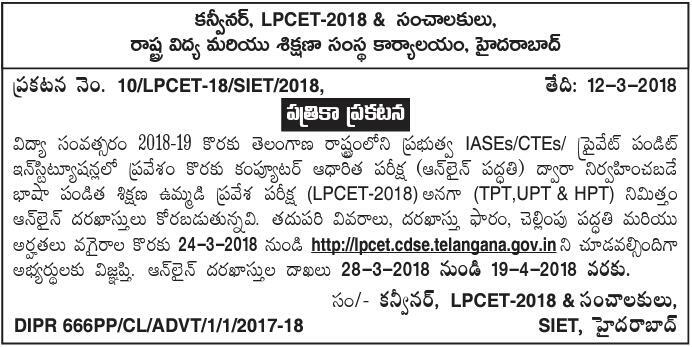 Applications will be received only through ‘ONLINE’ on LPCET -2018 website http://lpcet.cdse.telangana.gov.in from 10.04.2018 to 24.04.2018. He/She should satisfy Local / Non Local Status requirements as laid down in the Telangana Educational Institutions (Regulation and Admission Rules 1974) as amended from time to time. Age Limit: The candidates should have completed 19 years of age as on the 1st July of the year of admission i.e. 01.07.2018. There is no upper age limit. the minimum marks shall be 45%). minimum marks shall be 45%). The candidates shall first download the ‘Information Bulletin’ free of cost from the LPCET website http://lpcet.cdse.telangana.gov.in, go through it carefully and satisfy their eligibility for appearing at LPCET, 2018. The candidate after satisfying herself/himself about the eligibility criteria for LPCET shall pay a fee of Rs.400.00 through LPCET website between 10.04.2018 to 24.04.2018 for submission of application Online. At the LPCET website, the candidate has to give the required preliminary data (i.e. Name of the candidate, Date of birth, Gender, whether the candidate belongs to Telangana State and mobile phone number). On receipt of fee at LPCET website the candidate shall be issued a ‘PAYMENT REFERENCE ID’ with which she/he can proceed with submission of application online. Issue of ‘PAYMENT REFERENCE ID’ does not mean that the candidate has completed submission of application online. It is only a confirmation of the fee received. Applications with no photo / unclear photo / inadequate size photograph will be rejected. Hall – Ticket will not be issued to such candidates. Hence, after pressing the ‘UPLOAD’ button check if the photo is of required size, clear and is of the same candidate of whom the details are to be filled in the application. If the photo is smaller in size, not clear or does not belong to the candidate press ‘UPLOAD’ button below the photograph on the application form and ‘UPLOAD’ again.